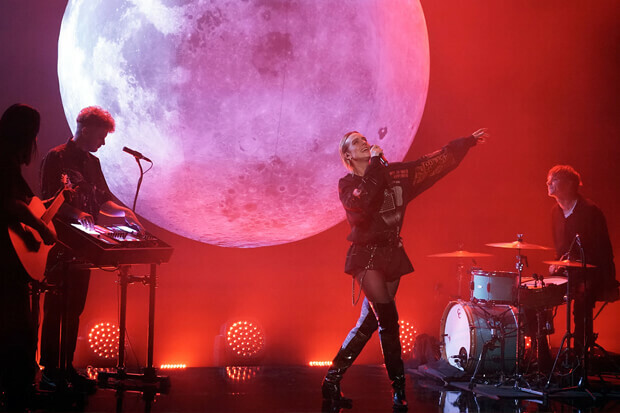 MØ Stops By 'The Tonight Show Starring Jimmy Fallon' To Perform "Blur"
MØ ushered in the new year with an appearance on The Tonight Show Starring Jimmy Fallon. The Dane stopped by the late-night show ahead of the North American leg of her Forever Neverland Ch. 2 Tour, and she marked the occasion with a performance of her current single “Blur.” Taking the stage in front of a full moon, she worked her way through a solo version of the Stint-produced banger – as opposed to the remixed version featuring Foster The People’s Mark Foster. Delivering a predictably strong performance, the “Sun In Our Eyes” hitmaker danced around with the support of a live band. Hopefully it will give the anthem a bit of a promotional push in the US. One of many highlights on MØ’s Forever Neverland, it deserves to make an appearance on the Billboard Hot 100. It will undoubtedly get even more love with a couple of performances on the road. Her tour kicks off with a set in DC tonight (January 15). From there she’ll make stops in cities including Boston, Chicago, Seattle and Los Angeles before playing one last show in San Francisco on February 9. Get ticket info here and check out footage from last night’s performance below!